For thousands of years, pirates have captured the imaginations of Americans. Pirates are glorified in stories, movies, and poems. From the 1800s on, famous pirates such as Sir Francis Drake, Captain Kidd, and Blackbeard have strongly influenced Florida history. Although these pirates are no longer alive today, you can still learn about their legacies and the chronology of pirates in Florida by visiting museums, shipwreck sites, and other places that pay homage to the area’s famous pirates and offer an opportunity for the inner seadog in us to come alive. Along the way, you’ll find campground accommodations that give you the freedom of traveling at your own pace. Since the 1500s, there have been a number of pirates along Florida’s coast. Pirates were initially drawn to Florida’s coast after the arrival of Spanish vessels, which started to use Florida’s accessible shores as a key stopping place. Pirates got word of these stopovers and started to attack the vessels, which were often filled with lucrative goods. In the mid-1500s, Florida adopted a Spanish admiral named Don Pedro Menendez as its governor. Menendez drove the pirates out of the state, but not before they left a lasting mark on Florida history. 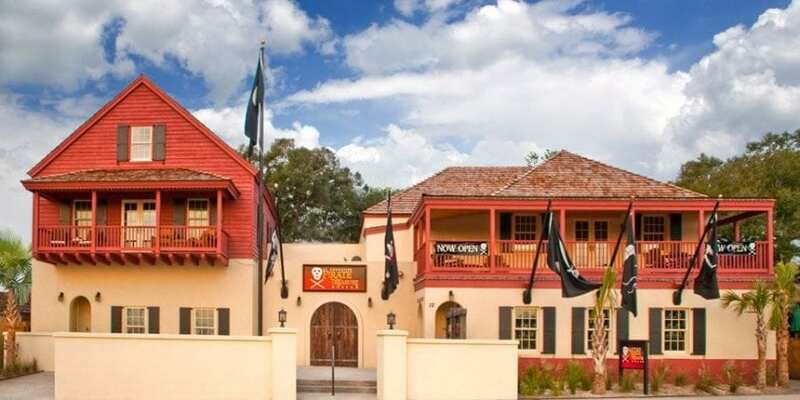 If you’re a fan a Florida’s pirates, there are several pirate-themed destinations not to miss. One is the St. Augustine Pirate and Treasure Museum which was originally located in the Florida Keys. 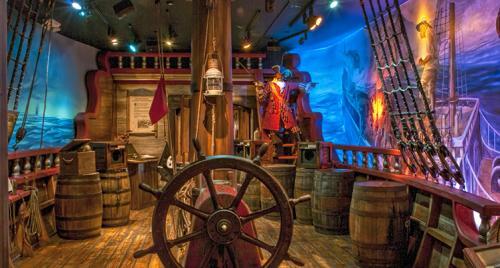 Also known as the Pirate Soul Museum, it is the largest and most authentic collection of pirate artifacts in the world. The museum is now located in St. Augustine mainly because the city itself was pillaged twice by Florida pirates. Although pirates are no longer a threat to St. Augustine, visitors can still stop in to the museum to learn more about who Florida’s famous pirates were and how they lived their daily lives. This expansive pirate museum is packed with a number of treasures, including re-created scenes of pirate life and a faux sleeping pirate. There are over 800 artifacts in the museum, including a real pirate chest! Another notable attraction is something called the “smell display,” where visitors can guess what objects are in the display case based on their smell. Leather, straw, and aged barrels are some of the cargo items that pirates lived with, and now you have a chance to see what a pirate’s ship might have smelled like. In addition to the visual displays, visitors can read about the history of their favorite Florida pirate. If you’re looking for a place to stay nearby, Anastasia State Park, which has both tent sites and RV hookups, is a great place to spend the weekend or longer. Within the Florida Keys National Marine Sanctuary is the Shipwreck Trail. Designed for the water enthusiast, Shipwreck Trail is a collection of everything from easily accessible dives to dives that are 100 feet or greater in depth. The trail contains many hidden treasures, including the Adelaide Baker. This fallen ship is laid to rest about four miles south of Duck Key. The ship dissipated upon sinking, and its remains are scattered in a quarter-mile radius from where the bulk of the ship lies. Diving to this wreck, you can see some hidden treasures as well as unique underwater wildlife. The San Pedro, which is about a mile south of Indian Key, is a sunken Spanish trading vessel. The San Pedro is believed to have been captured and sunk by marauding pirates off the coast. It is the oldest of all the ships on the Shipwreck Trail, and divers today can still see eerie remains of Spanish treasures that once made the ship a glorious symbol. Another notable shipwreck on the trail is that of the North America. This vessel was originally constructed (and sailed from) a harbor in Maine. The boat, laden with goods and furniture, disappeared in the 1840s. Its final resting place is in the Delta Shoals, which is located east of the Sombrero Key. Today, divers can venture 14 feet below the water’s surface to check out this ship and its skeletal treasures in person. The Mel Fisher Maritime Museum in Key West is an educational and entertaining spot to learn more about shipwrecks, pirates and treasures of the Florida Keys. In addition to the stunning museum, they have an amazing gift shop that offers actual coins and other booty to remember your trip. In addition to the museum, if you are planning on an extended state in the Florida Keys, the Dry Tortugas National Park is an amazing day trip that is not to be missed. Along the Shipwreck Trail, there are several RV campgrounds where you can park as you continue on your way. Down towards Key West is the Lazy Lakes RV Resort which features a spectacular coastal setting with nearly 30 acres of pristine sandy beaches and natural beauty. Another good option is the Grassy Key RV Park & Resort, which is notable for its stunning views and friendly management. If you’ve ever wanted to learn more about famous Florida pirates, there are many great places to check out to learn more. From the enchanting museum in St. Augustine to ghostly shipwrecks along the Florida keys, a pirate-themed adventure awaits for anyone who wants to experience this fascinating part of Florida’s past. While the modern-day pirate booty you collect may be memories rather than gold, the rich history of the Sunshine State’s coastal towns and forts will be certain to leave you enriched.